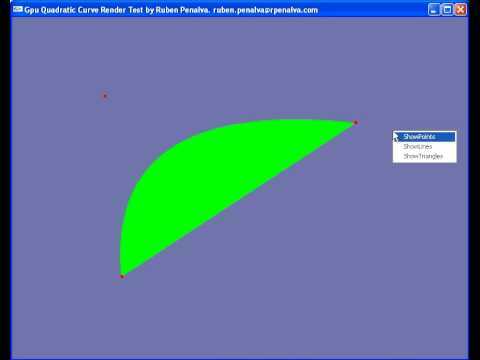 The test is just the opengl based application rendering an editable quadratic curve. It can be moved the control points of the curve in real time. The approach is the same as the one used by Loop and Blinn in the Gpu Gems 3 chapter and in the paper. Originally I was going to render a cubic curve too, but I didn’t have time to do it. Maybe in a next test. This entry was posted on Thursday, June 4th, 2009 at 22:43	and is filed under Codepixel, Tests. You can follow any responses to this entry through the RSS 2.0 feed. Both comments and pings are currently closed.